Located in San Diego Amazing Townhouse in Cortez Hill features air-conditioned accommodation with a balcony and free WiFi. 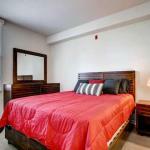 The accommodation is 900 metres from Downtown San Diego. The apartment has a cable TV and a living room. The apartment offers 2-star accommodation with a hot tub. In addition to an outdoor pool Amazing Townhouse in Cortez Hill also offers BBQ facilities and a terrace. Balboa Park is 1.5 km from the accommodation while San Diego Convention Center is 1.8 km from the property. The nearest airport is San Diego International Airport 4 km from the property.